1Tap the Contacts app icon on the Home screen to open the app. 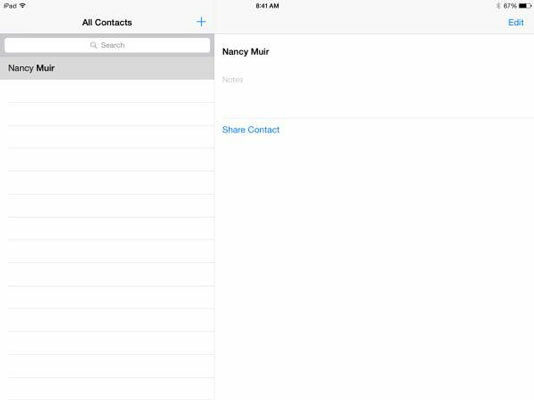 If you haven’t entered any contacts yet, you see a blank address book (except for your own contact information, which may have been added when you set up your iPad), like the one shown. 2Tap the Add button, which has a plus sign (+) on it. A blank Info page opens, and the onscreen keyboard displays. 3Enter any contact information you want. You only have to enter first name, last name, or company to create a contact. 4To scroll down the contact page and see more fields, flick up on the page with your finger. If you want to add information such as a mailing or street address, you can tap the related Add field, which opens additional entry fields. 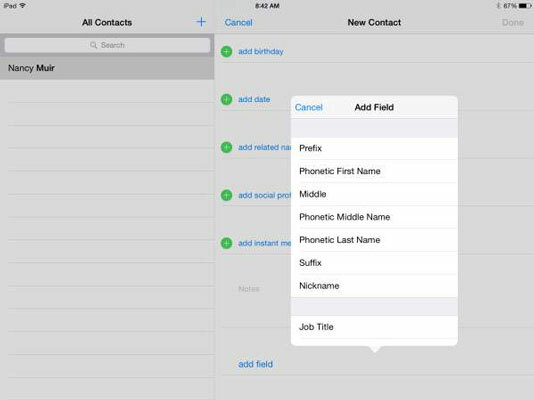 5To add another information field, such as Nickname or Job Title, tap Add Field toward the bottom of the screen. If your contact has a name that’s difficult for you to pronounce, consider adding the Phonetic First Name or Phonetic Last Name field, or both, to that person’s record. 6Tap the Done button when you finish making entries. 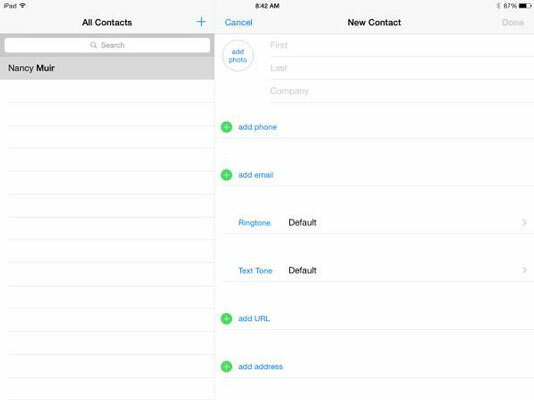 The new contact appears in your address book. The figure shows an address book with entries added. If you want to add multiple email addresses to a contact so that you can easily send email to all of that contact’s email addresses, enter a work email address in the preceding steps and then tap the Add email field, enter an appropriate title, and then enter another email address. Another Other field opens, and so on. 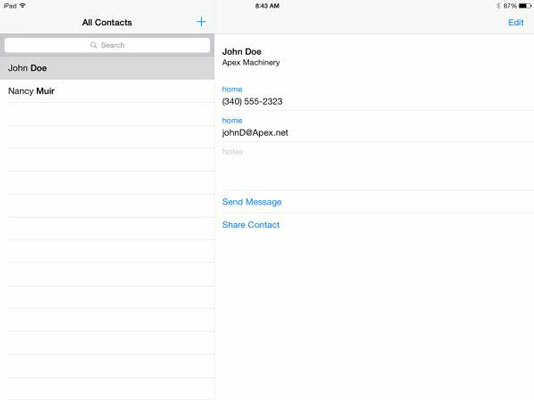 Simply enter all email addresses you want to include for that contact and then tap Done.